THE NCAA will open the Season 92 seniors basketball tournament on June 25 at the Mall of Asia Arena. Incoming NCAA policy board chairman Fr. Aloy Maranan of San Beda made the announcement on Tuesday during the turnover ceremonies at The Pearl Manila Hotel. 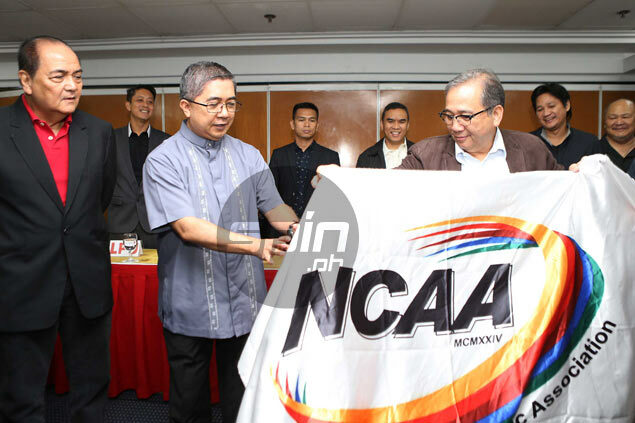 San Beda formally received the hosting rights as Reynaldo Vea of Season 91 host Mapua handed Maranan the NCAA flag. Maranan said the theme for the coming season is "Sports Build Character: Achieving Breakthroughs at NCAA 92." “We await this hosting to be a moment of collaborative effort among the member schools of the NCAA. Through the unity, hardwork and solidarity of everyone, we can look forward to an exciting NCAA this season,” Maranan said. Vea oversaw a successful hosting of Season 91 with competitive action not just in basketball but other sports. “We had a very competitive season I would say,” said Vea. “There were many pulsating games that have us on the edge of our seats not only for the students but also to the general public. In other sports, we also had a competitive situation as well. That added to the biding together of the NCAA as a community,” said Vea.